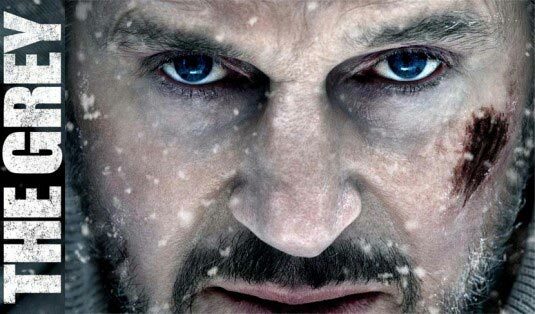 A group of tough guys led by Liam Neeson plane-crash in the frozen wastes of Alaska and have to try to make their way back to civilization while being harried by a pack of vicious wolves. Let me be honest, there's virtually no way they could make this movie so I wouldn't enjoy it. They would have had to do something utterly childish, despicable and self-destructive like, I don't know, include a shot of George W. Bush's severed head on a pike, to alienate me from a story that — as a lefty friend said to me, rolling his eyes — "sounds right up your alley!" But hurrah, they didn't ruin it. The film is everything it oughta be and more. It's tough, exciting and full of the sort of macho wisdom about struggle, strength, leadership, life and death that Hollywood seems to have all but forgotten. There're no women who unrealistically prove themselves to be as tough as the men. There are no speeches about how wolves are really nice and only harm you if you drill for oil. There are no sub-plots about tolerance. In fact, there's no tolerance at all — these are men, after all! There's just gritty, exciting, bloody action punctuated by more or less realistic reflections on what matters in life. Neeson is his usual great self, but kudos especially to director Joe Carnahan who has been going after the testosterone-fueled set with fun but not-quite efforts like Pride and Glory and Smokin' Aces. This time he hits the target. Makes me look forward to his upcoming adaptation of Mark Bowden's excellent book Killing Pablo.